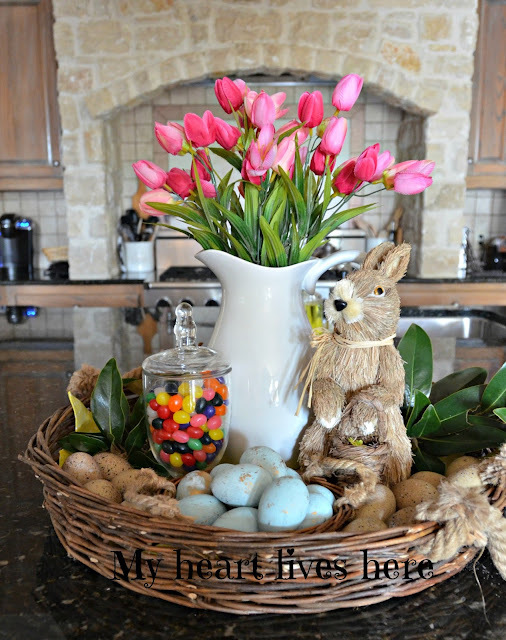 The large round basket on the kitchen island has become one of my favorite places to decorate for each season. Here's what I've put in it for Easter. Luckily, we have an endless supply of magnolia branches in our backyard. It's also a good thing that the jelly beans are out of easy reach. Jelly beans and magnolia leaves. What else could a Southern girl ask for? I was enjoying your kitchen and that magnificent stove-I just bet some yummy things are cooked on it! Your Easter centerpiece is cute! I haven't indulged in any Easter candy yet, but I'm sure I will eventually. I pass the big aisle in the grocery store every week! 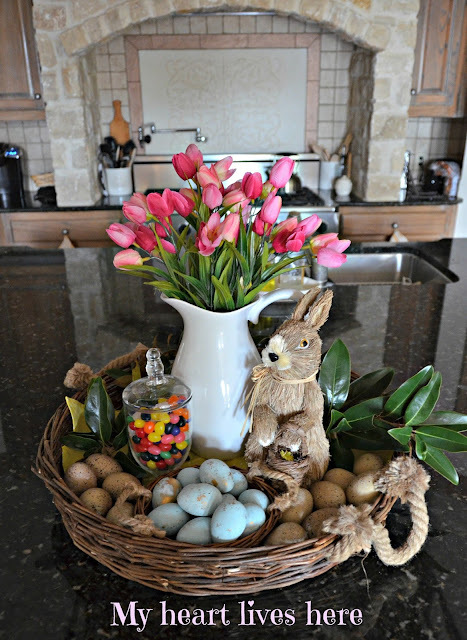 Love your Easter vignette and your kitchen island with the peak of your cooking area is awesome! I'm afraid I would be all over those jelly beans! Lol, Beautiful basket though, I love all of it! Thanks, Kathleen. I may have had one or two of them! What a darling vignette and your kitchen is GORGEOUS! Thanks for stopping by, Poppy! Thank you for stopping by, Poppy! Pink tulips.BIG SIGH! That sweet bunny is living the life isn't he? Shhh...don't tell him, but the tulips are fake! Oh your house....so pretty! I love the way you've gathered all the fun things on the tray. That's the way to do it! Happy Thoughts of Home on Thursday friend. See you soon. Thank you, Sarah. Happy Easter! Love tulips - my absolute favorite! Love how you put everything together in that basket and the magnolia leafs are perfect. Love that shade of green. What a pretty vignette and a nice kitchen! Thanks for sharing it at Your Inspired Design! Love it and I'm crushing over your brick around your stove! 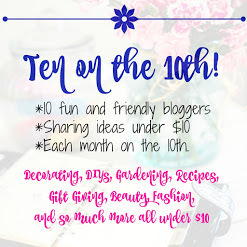 Thanks for linking up to Your Inspired Design! Have a great weekend, Eilis...pretty name. Thank you for visiting, Marigene! Thanks for sharing your beautiful vignette with SYC. I especially like your bunny. First of all I was distracted by your stove- how pretty! I love your idea of arranging everything in such a pretty basket. That is one of my favorite things to do- it anchors things, doesn't it? Ellis, it is wonderful! How would it be to have an endless supply of Magnolia leaves? :) Thanks for sharing with SYC. Ooohhhh can you push those jellybeans a liiiiitle closer????? Unfortunately, I LOVE jellybeans!! Your display basket is wonderful...I guess I will have to copy it and make my hubby a happy camper!! Such a pretty centerpiece. Thanks for sharing at Home Sweet Home! Hi Ellis, just hopping back to let you know that you will be featured at SYC tomorrow. Thank you! I'm tickled pink. What a pretty Easter vignette you've created! I love it, Eilis! I love you sweet Easter vignette! 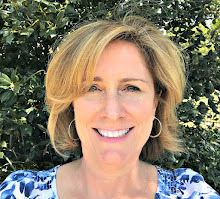 I have been snooping through your house tour as well, you have a lovely home. Happy Easter! Out of easy reach eh??? Maybe if they were on a shelf that was 10 feet up! LOL!!! I love the tulips with your vignette; it's adorable, Eilis! Hi, new to your site. 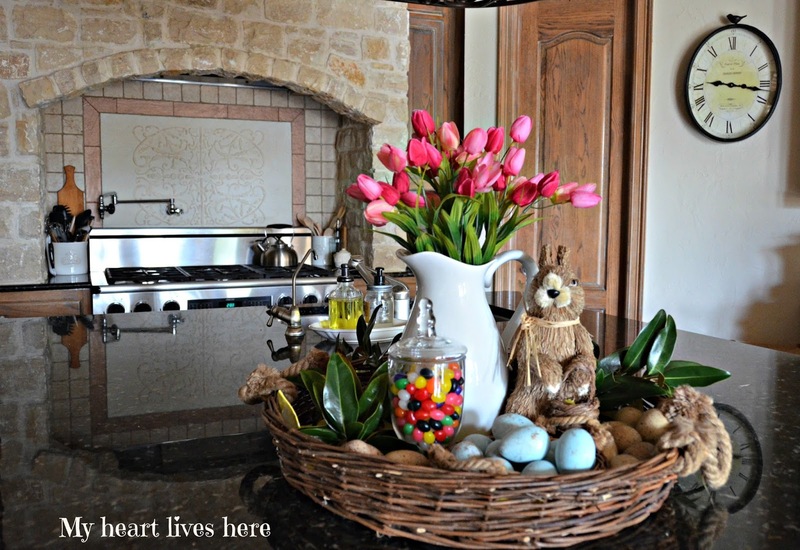 Love your Easter vignette and your kitchen! Stop over and visit, when you have a chance.